The Harleigh Series pet urn is a simple, tasteful way to create a memorial for your departed pet. The Harleigh Series pet urn features a front panel, and is available in oak with a medium finish. Made in the USA with FSC-certified, sustainably sourced North American wood. 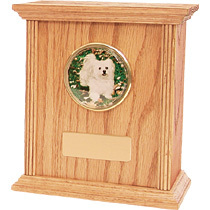 The Harleigh series pet urn comes with the option of a picture frame (shown) and a brass plate (shown) that can be engraved to further personalize these pet memorials.